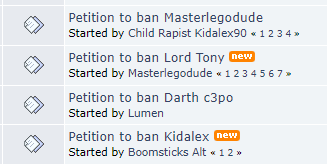 What makes users worthy of "Should be banned" threads? this is my only account and i have never made alts, yet i made a whole lot of cancerous posts i regret making to this day and got 4 bans. I have stopped posting much since then in fear of the last permanent ban. I refrain from posting most of the things i write and use preview an awful lot. TL;DR I have 2300+ cancerous posts i regret making and i've got 4 bans during my time in this forum, making me post way less than i used to in fear of getting perm-banned from this place.